Laser Vision Correction including LASIK eye surgery has been growing in popularity since its FDA approval in the mid-1990s. Millions of people have selected this surgical procedure with the possibility of eliminating glasses and contact lenses from their lives. LASIK eye surgery provides several advantages over glasses or contacts because it corrects the visual problem as opposed to simply treating the symptoms. For the most part, the clinical data suggests an overwhelming amount of people who have chosen LASIK eye surgery have had positive results. At the AAO in 2006, the American Academy of Ophthalmology even released a 10-year effectiveness study that concluded LASIK eye surgery was both safe and effective. Many celebrities and sports stars have even sung the wonders and value of this amazing eye surgery. In recent years, new technological advances have made LASIK eye surgery much safer and more accurate. Later in this chapter, we will discuss the new technologies that have enabled LASIK and laser vision correction to become more accurate and safe. Despite all of the positive outcomes, considering LASIK eye surgery is a matter to be taken seriously. Not everyone is a candidate for this procedure. Selecting the right surgeon and determining appropriate candidacy really becomes a critical issue in how well you will see after surgery. Please see some of the criteria listed below when starting your quest to select an appropriate LASIK surgeon. The first step in undergoing LASIK is the pre-operative evaluation. This process involves a series of diagnostic tests that determine the overall health of your eyes. Your cornea thickness is a critical component to your LASIK candidacy. If you do not have the proper amount of cornea thickness the procedure is not recommended. If you are a candidate after LASIK eye surgery we also suggest having a discussion with the actual surgeon who will be performing the surgery. The surgeon will be able to help you determine how successful the surgery could be. Expectations for LASIK surgery will be vital to your happiness so make sure to listen to your doctor's synopsis. LASIK, formally known as (Laser-Assisted In Situ Keratomileusis) is a refractive surgery procedure designed to reshape the cornea or outer surface of the eye. By reshaping the cornea LASIK surgeons can actually correct the refractive error of a patient. The common refractive errors that LASIK can treat effectively include myopia (nearsightedness), hyperopia (farsightedness) and astigmatism. LASIK eye surgery first involves creating a thin corneal flap with a unique device known as a microkeratome. 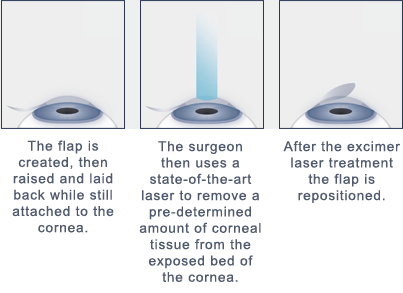 Once the flap has been created it is carefully laid back and the inner part of the cornea is prepared for Excimer laser treatment. The Excimer laser is then utilized and applied to the cornea removing the calculated amount of corneal tissue. The amount of corneal tissue removed is directly related to your specific visual needs. After the laser has been applied the thin flap is then repositioned in its normal position and several drops are administered. As patients begin to sit up from the surgical chair they typically notice an immediate visual improvement. At first, vision appears cloudy due to the drops administered but over the next day, you will notice drastic improvements in your overall visual outcome. The LASIK eye surgery procedure lasts no more than 10 minutes. Because LASIK treats the inner part of the cornea, the healing process occurs more rapidly. Patients typically resume normal activities within a few days. No stitches are required; however, protective sunglasses can be used at night to prevent the rubbing or bumping of your eyes. The first 72 hours after the procedure are critical to this healing process. Patients are asked to return home, get plenty of rest on the first night and use the eye drops to aid in the healing process. If you want to learn more or talk with a surgeon directly regarding your specific visual situation please fill out this self-evaluation form and we will call you to discuss your candidacy. After your LASIK eye surgery, you will need to have your vision examined on a regular basis. Make sure to ask your surgeon ahead of time what the costs involved with this process will entail. Traveling long distances to get your post-operative care might prove to be a serious burden, so make sure to weigh the benefits of selecting a surgeon within driving distance. You will need to schedule regular exams to examine your vision and check the healing process and bonding of the corneal flap made in surgery. Most LASIK complications occur as a result of a flap complication. If detected early enough your doctors will be able to react and correct the problem. Some LASIK centers may have hidden fees regarding post-operative care. Please make sure to ask about the cost of continued post-operative care. If you feel you have been improperly informed by a LASIK center with false advertising or hidden fees please let our trade associations know about the matter or contact the Eye Surgery Education Council or ASCRS (American Society of Cataract and Refractive Surgery). Disclaimer: The intent of this website is to educate users about eye care. Information found on this website is not intended to replace medical advice. Questions about treatment information should be addressed by your physician. If you are seeking LASIK in Pennsylvania please do not hesitate to contact us directly for a FREE patient consultation. Your source for LASIK in Pennsylvania.